Simply put, the Swiss Alps are perhaps the best supported hiking destination in the entire world. Where else can you enjoy drop-dead gorgeous mountain scenery and never have to carry anything more than a light daypack? Even on long-distance trails like the Haute Route you can walk for days on end without a tent, sleeping bag, food, or stove. That's because the well-linked system of mountain huts provides great meals, a hot shower, and a comfortable bed in a variety of lodges that are spaced out nicely along its length. But for those travelers who are looking to spend some time in the Alps, but may have a limited amount of time or cash, a great day hike may be a nice alternative. Trekkers will be able to enjoy the mountain scenery, waterfalls, glaciers, wildlife, and wildflowers during the day, and still be back in town or moving on to their next alpine destination before sunset. 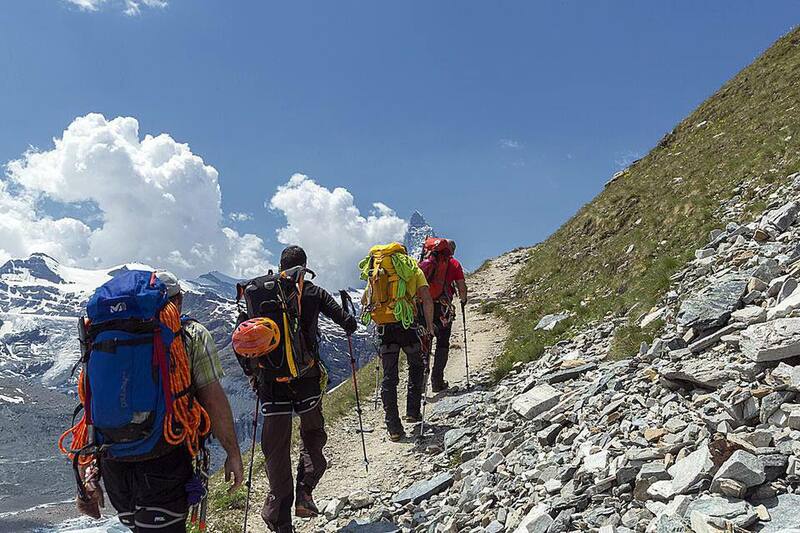 These recommendations are for the most magnificent day hikes that the Swiss Alps have to offer. Each is well-marked, easy to follow, and can be hiked in either direction, bringing a nice level of versatility to your route planning. Generally, you’ll find all of them charted on free maps available from local tourist information offices throughout the region. In most cases, there is a cogwheel railway, funicular, or gondola to speed you to a high and scenic elevation to get started with the walk. Most importantly you’ll find plenty of huts, inns, and mountain restaurants along the way where weary hikers can recharge with cheese, chocolate, apple strudel, and other fine delicacies. Zermatt is touristy to be sure, but within five minutes of departing the town center hikers are already leaving wildflower-spangled meadows behind on their way up to larch forests instead. The route takes you up the steep valley walls with dramatic views that overlook the city below. Soon you emerge above treeline and enter a high alpine meadow known as the Höhbalmen, where a sweeping panorama of Switzerland’s highest peaks spreads out before you. Your descent offers spellbinding views of the Matterhorn to the right and a look at the Zmutt glacier below, topping off an already-spectacular day in the mountains. Once again, the Matterhorn is the showstopper here, but you can quickly access the postcard-perfect views by taking the cog-wheeled Gornergrat train to Riffelsee, where you’ll discover mirror-reflections of the iconic mountain in the small glacial lakes. Descending to Rifflealp, you’ll be tempted to stay the night at the elegant Rifflealp Hotel—which is not a bad choice by any standard—but continuing down to cross the Findelbach canyon leads you past more shimmering lakes and drop-dead gorgeous alpine meadows. The Sunnegga funicular makes for a quick descent back to Zermatt, although if you have time consider taking the forest path through the hamlet of Findeln on your return. It is absolutely charming and well worth a visit. Make a quick escape from the hustle and bustle of the ski-resort town of Verbier by taking the gondola to Les Ruinettes and continuing on a short stroll to the Cabane du Mont Fort. There you'll find breathtaking views of the legendary Mont Blanc massif. After that, it’s on to the Sentier de Chamois (the Chamois Trail) where you’re likely to spot both ibex and chamois on the rocky slopes above, while enjoying a commanding view of the Val de Bagnes below. Crossing the Termin Pass, you’ll arrive at Lac de Louvie, a stunningly beautiful gem of a lake with fascinating 200-year old stone barns at its head. Ring the lake, take in the views of the Grand Combin massif, and descend through the dense forest to the village of Fionnay where you can catch a bus back down the valley or return to your starting point in Verbier. For high-level panoramic views of the Jungfrau, the Faulhornweg is a hiker’s dream. From Grindelwald, take the gondola to First, where a well-worn path leads to the Bachalpsee, which creates an infinity-pool with the backdrop of the Eiger, Monch, Jungfrau, and other famous snow-clad peaks. Soon, views to the north open up to overlook Interlaken and its glistening lakes on both sides. You’ll conclude at Schynige Platte, where the gardens display over 600 alpine species and the 360-degree views are among the best in all of Europe. A mountain railway that dates to 1893 takes you on the descent to the village of Wilderswil where you'll find easy connections to Interlaken or back to Grindelwald. Ringed by 72 waterfalls, Lauterbrunnental is the world’s largest glacial valley, outshining even the spectacular and massive Yosemite. There’s no better introductory hike to this incredible valley than the loop that leads from the town of Lauterbrunnen up to Grütshchalp (take the tram or the steep trail), then along a gentle forest path, crossing a dozen streams, to the hillside village of Mürren. You’ll find plenty of picturesque viewpoints along the way before the route descends to the lovely village of Gimmelwald. From here you can take choose to walk or take the tram back down to Stechelberg at the top of the Lauterbrunnen valley. Return to Lauterbrunnen by bus or follow the riverside trail past meadows, small farms, and waterfalls on every side. If you like hiking, but a trip to Switzerland isn't in the cards, Salt Lake City is probably the greatest hiking destination in America. Name another city in the country where within 300 yards of the state’s Capitol building and the downtown center you can be walking in a protected nature reserve, while spotting elk and raptors. For a description of five great hikes in this city click on Salt Lake City hikes.